> Can electric cars drift? It seems like drifting could soon be a much less polluting sport than ever. 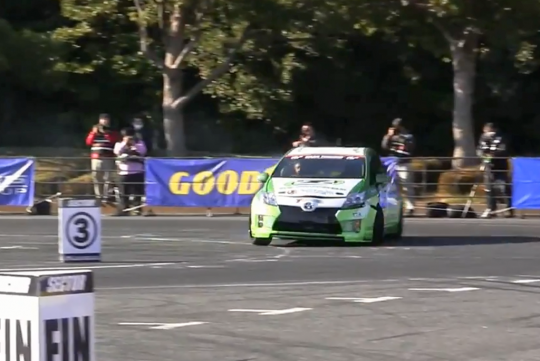 VERTEX T&E and OZ Motors of Japan recently showcased a EV Prius which looked like it has some potential to be a decent drift car at the recent Tokyo Auto Salon 2015. While there seem to be a lack of information on the car, it is believed that the electric, rear-wheel driven Prius is still under development and should produce about 400bhp when ready. Watch the demonstration below and marvel at how weird it is to see a car drifting without any engine noise. More like playing with R/C cars. If they made a 400hp rear driven Prius, I would want to buy one. Prius......never known to be a sport model but requiring 400bhp ? Want to win who ! There must a joker around.